Shortly after 178 physicians in Ontario signed a letter to Ontario’s Minister of Health requesting a basic income, the Canadian Medical Association as a whole decided to endorse the idea at its General Council. 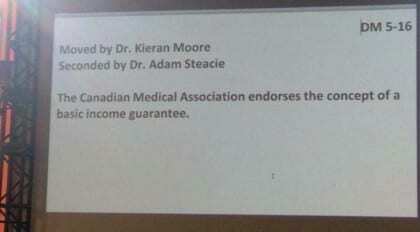 Ontario delegate Dr. Kieran Moore raised the motion for a basic income guarantee, and Dr. Adam Steacie seconded the motion, leading to a vote where the motion passed with a sizable majority, according to Danyaal Raza on twitter. This continues the nationwide momentum for a basic income throughout Canada.